As the weather grows cooler, the brisk mountain air paints the leaves of the forest trees in brilliant reds, yellows, and oranges. 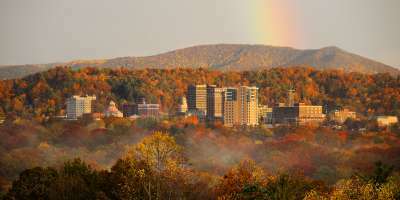 Given Asheville&apos;s climate and the variety of elevations nearby, Asheville enjoys one of the longest and most vibrant fall color seasons in the nation. The first hints of fall arrive in the mountains in late September. The color change picks up steam in the first couple weeks of October. The fall leaf season often extends well into the month of November. As you plan your visit, check out these 5 things you need to know about fall in Asheville. As we await the fall color change, along the Blue Ridge Parkway and throughout the mountains you&apos;ll see a beautiful display of wildflowers including goldenrod, witch hazel, aster and mountain ash. We asked fans of our Visit Asheville Facebook page to share their favorite ways to enjoy fall in the mountains. We’ve tallied those responses, and added some insider information from the locals, to bring you this Top 10 list. 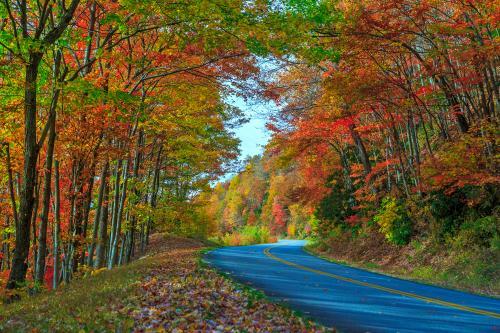 Asheville is home to some incredible scenic fall drives. 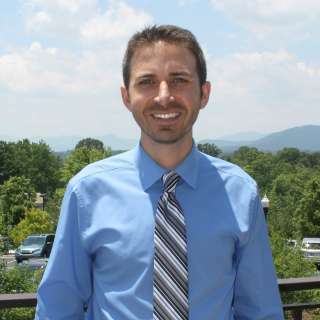 Chief among those (and the top favorite with our Facebook fans) is the Blue Ridge Parkway, which winds around some of the highest peaks in the eastern U.S. Roll the windows down and enjoy the crisp breeze and prepare to be dazzled by the pop of color around every turn. Dozens of overlooks along the way provide the perfect photo opps. The variety of elevations on the Parkway offers a chance to see fall at its best throughout the entire season. In early fall head to higher elevations above 5,000 feet. In mid-fall peak color lights up spots in the 3,000 to 4,000-foot range. In late fall, lower elevation spots at less than 2,000 feet are your best bet. In addition to the Parkway, other top fall drives include US 276 through the Pisgah National Forest which takes you by thundering roadside Looking Glass Falls, and NC 215. All the routes are also excellent on two wheels. Motorcyclists can hug the curves on these winding rides. Gryphon Bikes in Maggie Valley even offers group customized tours. Maggie Valley is also home to the Wheels Through Time Museum which features more than 300 rare bikes. While the hiking trails are beautiful year-round, fall adds a certain magic to a hike in the mountains. 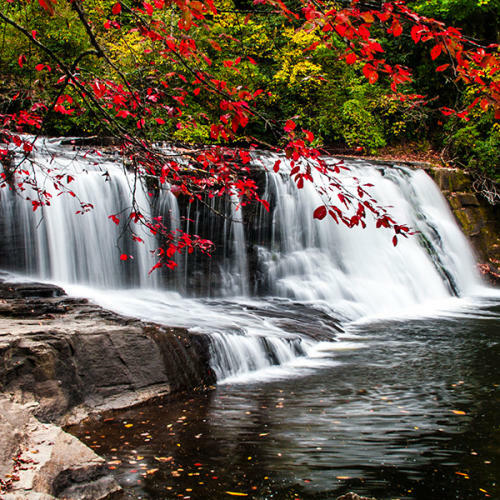 Waterfalls wrapped in bursting fall color are a sight for sore eyes. Our Facebook fans’ top choices include Crabtree Falls off the Blue Ridge Parkway, Looking Glass Falls along US 276, and Rainbow Falls in Gorges State Park. If you’re looking for sweeping views, try Black Balsam, ideal for leaf peeping in October. 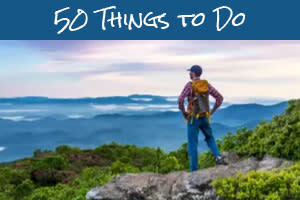 Our followers also highlight Craggy Gardens and Graveyard Fields as favorites. A bounty of state and national parks are within day-trip distance of Asheville. In early fall, head up to Grandfather Mountain, which features one of the highest peaks in the Blue Ridge Mountains. You can drive almost all the way to the top and walk across the Mile High Swinging Bridge. Two entrances to America’s most visited National Park, Great Smoky Mountains National Park, are an hour’s drive from Asheville. One of the most beautiful places in the Park in the fall, Cataloochee Valley, is also a great place to spot elk. Start and end the season at Chimney Rock State Park, which offers dramatic views of Hickory Nut Gorge and Lake Lure. See why Chimney Rock is a premier birding location at the Flock to the Rock event in mid-September (Sept. 15, 2018). For peak fall color, return toward the end of the season in late October/early November. Nothing says fall like the crunch of fresh apples or a soothing glass of warm apple cider. Just to the south of Asheville is one of the nation’s top apple growing areas. Dozens of apple orchards offer free visits during harvest and allow you to pick your own apples. While driving on the Blue Ridge Parkway, consider making a stop at the Orchard at Altapass. In addition to fresh apples, the orchard hosts mountain music and serves up fresh fudge. For the adults, Asheville’s Noble Cider and Urban Orchard Cider Co., and Black Mountain’s Ciderworks and Meadery, offer delicious hard cider. Many area restaurants draw from the local harvest to create farm-to-table fall dishes like the Apple Stack Cake recipe created by Early Girl Eatery. To go with your apples, head to one of the 17 tailgate markets in the Asheville area or the Western North Carolina Farmers Market to fill a picnic basket with locally-grown goods for an al fresco meal in the mountains. There are countless picnic spots along the Blue Ridge Parkway where you can spread out a blanket or grab a table and be surrounded by the fall foliage. But our Facebook fans say Max Patch is their favorite place for a picnic, given the stunning 360-degree views. Check out these four other panoramic picnic spots to explore. Leave the car behind to truly immerse yourself in the fall colors. Countless outdoor adventures are available for thrill seekers looking for unforgettable experiences. Take a stand-up paddle board tour with Wai Mauna SUP Tours on the world’s third-oldest river. The “Fall Foliage French Broad Float” is a unique way to view the leaves as they change. For early-risers, the sunrise tour makes for an especially magical experience. For a more low-key river experience, grab a line and a pole to enjoy the serenity of local fishing holes. Several guide companies offer gear, trips and on-stream instruction to help you fly fish like a pro. The most unique views of the fall leaves may be from the air. 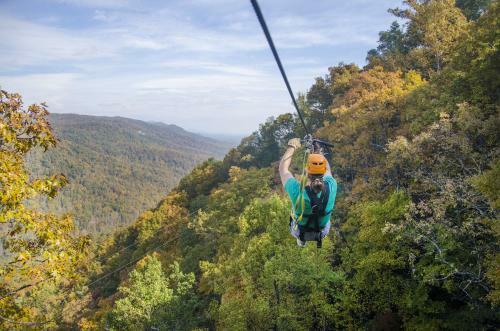 Float over the forests on a trip with Asheville Hot Air Balloons or soar from tree top to tree top on some of the best zip line canopy tours in the nation. There may be no better place in Asheville to see fall color than at Biltmore, America’s largest home. Stroll along the Estate’s trails or take a guided horseback ride for iconic views of the Blue Ridge Mountains in vivid color. Biltmore’s fields, gardens, and vineyards also take center stage in the fall with harvest menus at the estate’s restaurants. 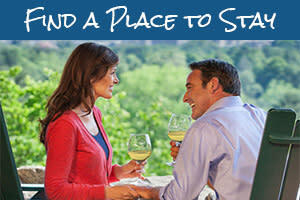 The Taste of Biltmore, featuring tastings, wine-focused meals, and specialty tours, kicks off the season in September. Fall music festivals are a tradition in the mountains. Among the largest of music events is the LEAF Festival in Black Mountain (Oct. 18-21, 2018). Music from a diverse range of cultures rock four stages with the Blue Ridge Mountains as a backdrop during the three-day festival. Franny’s Farm plays host to 18 acres of non-stop music over three days at the annual Barnaroo (Sept. 28-30). The festival showcases local and regional performers and is free. Head to Oktoberfest at Sierra Nevada Brewing Co. (Oct. 13, 2018) for great fall beers and live glassblowing demonstrations in addition to a full music performance lineup. The big Oktoberfest celebration in downtown Asheville is a week later (October 6, 2018). And the beat goes on all over Asheville as musicians and performers of all types hit the stages of local music venues almost every night of the week. In the Asheville area, art is everywhere, especially during the fall. Kick off the season in neighboring Weaverville (just seven miles from Asheville) with the 11th Annual Art in Autumn Outdoor Arts and Crafts Festival (September 15, 2018). 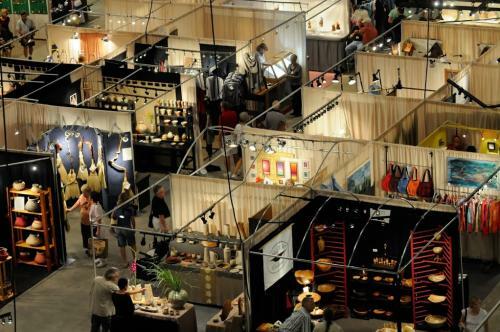 The 70th Annual Craft Fair of the Southern Highlands (Oct. 19-21, 2018) headlines a patchwork quilt of fall art experiences. Over three days in the U.S. Cellular Center in downtown Asheville, nearly 200 juried regional artists of the Southern Highland Craft Guild showcase their designs, host craft demonstrations and sell their work. Asheville’s neighboring towns put on their own art shows in October. Check out Old Depot Art By the Tracks in Black Mountain (Oct. 27, 2018) and the Art Safari in Weaverville (Nov. 3-4, 2018). No matter how you plan to enjoy the fall, many of our Facebook followers say “just being here” in the Asheville area for the season is an experience in and of itself that you don’t want to miss. With an extended vibrant color display and a vast array of adventures at your fingertips, the possibilities for enjoying an unforgettable fall are endless. Subscribe to get weekly fall color reports in your inbox! You&apos;ll also receive our monthly eNewsletter and may unsubscribe at any time. Parkway photo by Jared Kay. Waterfall photo by Rob Travis. Zip Line photo courtesy of Navitat Canopy Adventures. Craft Fair of the Southern Highlands photo courtesy of Southern Highland Craft Guild.